South West Trains stated in July 2013 that there would be improvements to the forecourt including better cycle facilities. Executive Member for Economy, Transport and Environment at Hampshire County Council. On Tuesday, 4 November 2014, Hampshire County Council’s Economy, Transport and Environment committee will decide if they want to give £300,000 to South West Trains, who have already gone 48% over budget on redeveloping the Fleet train station. Even though Hampshire County Council claims that it “has been working with South West Trains and Hart District Council to provide advice on the design and road safety aspect of the proposals” there are no strict conditions placed on South West Trains regarding the design of the forecourt. It is good that the forecourt is to be funded but the Council must be clear what it wants in return for the money: conditions must be attached to build Dutch-style space for cycling that reduces road danger. The Council will being basing its decision on a preliminary plan from July which contained absolutely no safe provision for people who choose to walk or cycle to the station, including people with disabilities. If the Council do approve the funding based solely on this report then there is a risk that South West Trains will just build the poor quality and more dangerous forecourt shown in that preliminary plan. The draft plan for the forecourt…may put people who cycle in danger’s way by making them cycle around moving buses, taxis and people pulling into or out of car parking spaces. I have written to the Council with my concerns: See the CORRESPONDENCE section below. The present forecourt of Fleet station. Recently, a driver overtook me in the forecourt then cut right across my path in his hurry to drop off a passenger — see the YouTube video HERE (and embedded below). The preliminary plan for the new forecourt leaves the layout where that incident occurred almost unchanged – except for adding in traffic which is exiting the bus and taxi area! These works were already promised back in July 2013 by South West Trains who stated then that there would be “Improvements to the layout of the station forecourt area, including better bus access and cycle facilities”. However, as revealed through an FOI, South West Trains isn’t too good with taxpayer money. It went £2,871,000 over budget and did not complete all the redevelopment it said it would do. Hamsphire County Council though seems unaware of this overspend, judging by statements made by Mr Sorrell in his report. 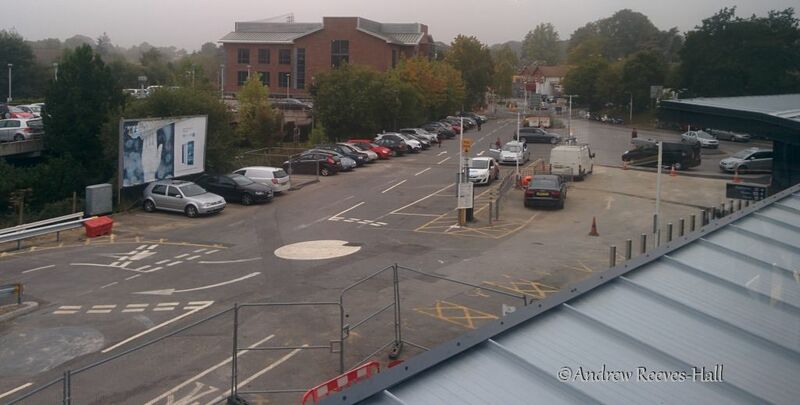 South West Trains did complete the works that benefit people who chose to drive to the station: a car deck. They have also installed pay and display ticket machines for them. Alas, it appears there wasn’t time or money available to put back the bicycle storage it ripped out, let alone making the forecourt safe for people who choose to walk or cycle to the station. People challenged with disabilities would benefit from improved access too. A separate wad of cash to improve access to the station from the surrounding road network is being sought through the Enterprise M3 LEP Sustainable Transport Fund (this is the scheme that is funding the rebuild of the Blackdam Roundabout in Basingstoke. This is the junction that the Highways Authority contractor has admitted won’t be safe to cycle through once complete – but that’s a story for another day). My emails to and from various government and publicly elected officials; or South West Trains. My emphasis added. I have just read your report to the Executive Member for Economy, Transport and Environment at Hampshire County Council titled “Fleet Railway Station Forecourt” dated 4 November 2014 (the date of the upcoming meeting to decide on giving £300,000 to South West Trains). I cycle to and from Fleet station each working day and have had near misses in the forecourt area, as well as on the road to the northern car park. The latter incident was reported to the police and resulted in a penalty notice to the driver. I am very concerned that your decision report does not put any conditions for desired outcomes on South West Trains in exchange for funding. They need to be there: SWT promised to put back bicycle parking that they ripped out last year – and add more – but they have never fulfilled that promise (or subsequent assurances that additional temporary bicycle parking will be provided within weeks); plus the forecourt has been left in a dangerous state for months. If the Council approve your report as it is then I feel that SWT will use that as a reason to build the forecourt as shown in their preliminary plan dated July 2014 which you include in your report. That plan makes the current dangerous forecourt even more dangerous for people that cycle and walk. A fundamental rethink of its layout is required. May I see the most recent plans, please? Do they conform to best-in-practice cycle routes as used everyday in The Netherlands? By the way, the total funding to date of the incomplete works at Fleet isn’t £6.5m as you state in the report, but is actually just shy of £9m. Your tweet, ‘Fleet forecourt funding from Hampshire must be given only with conditions requiring #Space4Cycling ‘, has been noted. The scheme is, as you are aware, not on the Highway and therefore the responsibility of South West Trains. Hampshire County Council is very keen to see these improvements given the current situation and potential conflict between all user groups. South West Trains are currently out to tender on the scheme which includes improved bus provision, installation of dedicated cycle/pedestrian routes, increased cycle storage provision whilst also recognising the need to incorporate improved taxi, kiss & ride and motor bike facilities. This work is part of a wider South West Trains project at Fleet Station and our proposed contribution has enabled us to influence the designs as well as provide advice on the safety of the proposals in terms of all users, with particular focus on pedestrian and cycle movements. Hampshire County Council is content that the scheme being proposed achieves the best available balance between modes, bearing in mind South West Trains objectives for the scheme. The availability of cycle parking is clearly a major concern as capacity sits at 86% (SWT Survey Jan 2014) with 69 hoops and 4 Lockers. It is also recognised that on some days there are no available hoops leading to bikes being locked against railings. I am therefore pleased to inform you that the scheme proposes to expand the cycle parking capacity of the upside (London Bound) by introducing double decked cycle stands for 40 extra cycles. There are plans to consider even more cycle parking in the station curtilage but the details are yet to be confirmed. If you wish to see the plans or comment up on the design then you will need to contact South West Trains direct. Thank you for that detailed reply. I have asked to see any updated plans but South West Trains refuses to provide them. They also promised to put them up on the station and on the website but that too they have not done. If Hampshire County Council has had sight of a plan that is going out to tender since the preliminary July version included in the report then please could you to send it to me? You did not address my key point: that I would like to see you include conditions on the funding which include requiring South West Trains to install proper segregated cycling provision. This I feel is especially important because, as you say, it is a private road being funded by public money. The report being voted on today should either include the plan that has gone out to tender or nothing – to be clear: the preliminary one should be removed so that there is no possible way that South West Trains could claim that Hampshire County Council has approved that inadequate and dangerous preliminary plan. Whilst I welcome the news of the double decker parking, please remember that South West Trains removed and did not replace bicycle parking at the start of their development; they also ripped out the secure bicycle parking and did not replace it. Hart Council is on record as wanting an increase in cycle parking beyond the number that was originally there. I have amended my decision to reflect a concern for cycles and cycling and matters will need to be agreed with South West Trains to my satisfaction before any money is forthcoming from Hampshire County Council. Concerns were raised on the matter also by Cllr Sharyn Wheale to whom I have copied this response. Could you give me an update on the Fleet station forecourt plans, please? Also what is the status of bicycle parking at the station? there is not a great deal to add regarding the forecourt. Currently we are still working on the design, although this have moved on to include a full review of the existing drainage as it may no longer be fit for purpose. The cycle scheme has gone out to tender, which is great news as even though not all of the existing cycle storage is being used at the moment, there are around 20 cycles that would be unable to find a hoop given current usage. We are looking to install some temporary cycle storage in the area in front of the station building, that we have left out of use for this purpose. We hope to have these available within the next 3-4 weeks, but much sooner if possible. The area manager and myself met with 2 gents from Fleet Cycling recently and had a very productive meeting regarding the station and working together in the future. The meeting was also to give permission for a customer cycle survey to be conducted, which the area manager gave his blessing to. Thank you kindly for that update. May I see the plans for the cycle scheme that you refer to, please? I was told by DfT that funding is not available until 2015/2016 and will be coming from “Hampshire City Council” (sic) — can you confirm? They also gave no indication of there being £300,000 given by Hart District Council. I am pleased to see Fleet Cycling (CTC) conducting a cycling survey at the station; I was also pleased to learn from the chair that you are supporting them with that. FYI – I conducted a bicycle count survey in mid/late September and found an average of 158 bicycles are parked at the station – the highest I recorded was 184. I counted 128 places where bicycles can be parked and locked up; which would explain why there are so many attached to fences! Can you at least confirm that funding isn’t until FY 2015? What is within the “cycle scheme” tender? Can you provide yet an update? Has information about decisions/plans been posted on your website and Fleet station as you promised? Are there any new bicycle racks being installed imminently? If the forecourt scheme has gone out to tender then may I see the updated plan which you distributed? (I was separately told by Hampshire County Councillor Seán Woodward that you now include “installation of dedicated cycle/pedestrian routes” in it). Hampshire County Council currently have the old, preliminary plan in their report for tonight’s meeting where they will decide if they will give you £300,000 of taxpayer money. I am seeking assurances that only a much-improved plan that includes proper segregated cycle routes to reduce road danger in the forecourt is funded, and not the dangerous preliminary plan. Note: I have copied this message to my MP for his info; and to Hampshire Councillors involved in approving the recent funding to South West Trains. Today, South West Trains published its latest newsletter but failed to include any update on the progress of development at Fleet station. One month ago I asked to see the updated forecourt plans for Fleet station following the approval of £300,000 funding by Hampshire County Council. I had no reply. Instead, in that space where the secure bicycle parking once stood until South West Trains demolished it, is a collection of over a dozen parked motorscooters. Please may I have an update on progress at Fleet station? 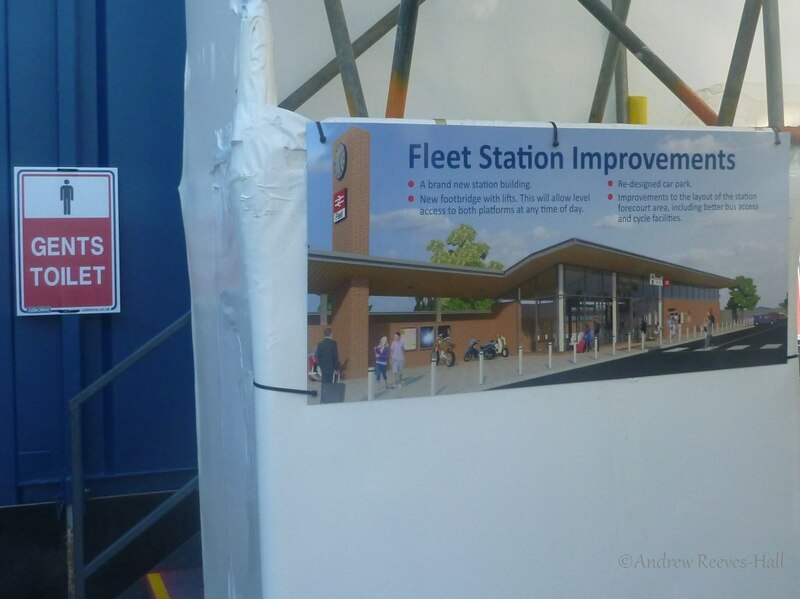 Thank you for email dated 5 December 2014 and interest in the Station Improvements at Fleet Station. The main focus of the South West Trains newsletter is to provide Passengers with an overview on a number of topics not just stations. The previous newsletter gave an in-depth summary of stations including the new station at Fleet and associated works. I believe we have previously forwarded draft plans for the forecourt to you but as yet these are still be finalised. As soon as the plans have been approved we will be informing Passengers at Fleet as well as providing timescales of the improvements. Plans for the additional cycle capacity have unfortunately been delayed for which I apologise but works will hopefully commence during the early part of 2015 with temporary additional cycles facilities being installed during January 2015 as well as a defined motor cycle parking area. Further improvements in the form of new extended canopy/waiting room on the London bound platform will also be installed during 2015. I apologise for the ongoing inconvenience and disruption at the station but can assure you we take Passenger feedback and satisfaction very seriously and as a result of your feedback have arranged for a review of our communication of this project.